In a nutshell, this treatment is a superior way of exfoliating your skin and removing all those unwanted agents that can build up and afflict our faces. These agents include, but are not limited to, facial ailments like acne or rosacea; air pollution; sun damage; dead skin cells; excessive oil/sebum; and weather elements. Microderm machines incorporate crystal or diamond based technology to slough off these nasty substances. This will result in new and healthier skin emerging to the surface of your face. This then vastly improve your skin’s complexion; tone; appearance; functionality; and overall health. For more information on the overall process, check out my Best Mircrodermabrasion Machine guide on this issue for a full review of everything to do with this issue – including the leading causes of skin accumulation; how it actually works; the reasons why we should be all use this exfoliating method; and the Health Base’s quality checklist that is vital for securing a top grade home kit. In addition, feel free to pop over and have a look at my review of the Trophy Skin Home Kit which I feel is the best such machine on the market today. 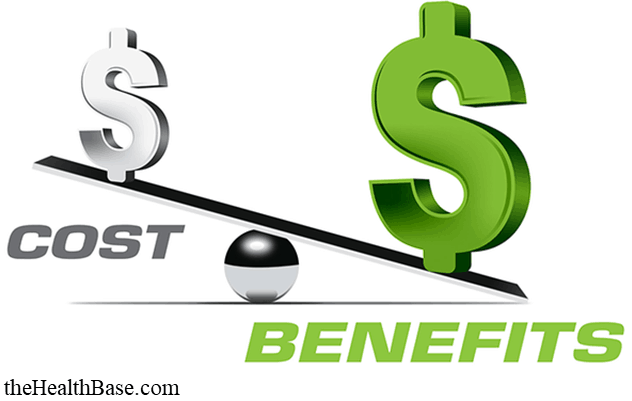 It’s great to say that money and cost doesn’t matter when it comes to our health. It probably should be true to say this! Unfortunately, as I’m sure you’re more than aware, this simply isn’t the truth. We all have to factor in the money side of things. This is something that really cannot be avoided. The same goes for microdermabrasion machines. If you are thinking about purchasing such a machine, then inevitably your decision will come to weighing up whether the benefits of owning such a machine are worth the cost. In terms of this cost, a quality machine and kit should cost between $200 to $300. Anything less or anything more should set alarm bells off in your head! Now, at first this price might seem to be a bit much. However, if you consider the following two aspects then you’ll soon see just how much of a bargain this price actually is. 1: Much better value than visiting a professional clinic: A visit to such a clinic will cost anything from $80 to $200 on each occasion. Therefore, having your own machine is certainly far more cost effective. 2: Only a one off payment: It is recommended by dermatologists and skin care specialists that you should avail of 10 microderm treatments if you are to see the full benefits of this exfoliation technique. If you were to visit a clinic ten times, this would mean that you’d end up spending between $800 to $2,000. This is quite excessive. It’s certainly more logical to buy your own machine for a one off payment. The great aspect about this treatment is that it is such a modern technique – one that takes advantage of both the scientific and mechanical advancements of recent decades. These advancements have resulted in a treatment that is both non-invasive and non-chemical in its application. These machines are undoubtedly the rising star in exfoliation techniques available today in the health and beauty industry. It’s certainly not a fad as this technique has been tried, tested, and proven to be super-effective by both medical professionals and the consumer. Personally, I believe that home machines are a brilliant example of just how far the beauty and health industry has come in its product creation sector. The fact that we can now have such an excellent exfoliation experience from the comfort of our own homes is such a pleasure, not to mention a real money saver!! This is quite obviously one of the major benefits of home microderm machines. The fact that these home kits can treat such a variety of different facial maladies is the reason why this method is one of the most prized home treatments. Another massive advantage of home treatment is that you can use it on different parts of your body – whether this be your face, chest, arms, neck, hands or other areas. Below is a quick list of some of the most common facial ailments that this treatment type can effectively treat. 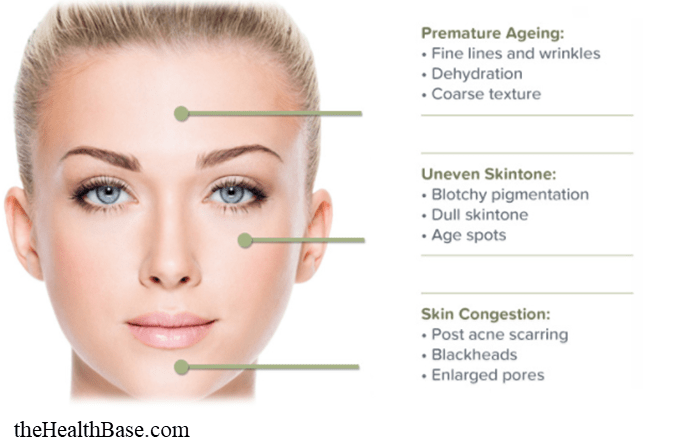 As you can see from the above list, microdermabrasion is multi-functional in terms of the ailments that it can target. This makes this treatment both super effective and flexible when it comes to treating skin issues. When it comes to home health and beauty treatments, a key aspect is that the products are flexible enough to suit any type of person. This is a key necessity for products in this niche. Why you ask? Simply put it’s because we are all different and unique! There are no two people that are identical. In fact, there are no two people that are even close to being the same! This is especially prevalent and true when it comes to our skin. People’s skin are so varying despite the fact that skin types can be broadly broken up into different categories like oily, sensitive, dry, combination et cetera. However, many people’s skin falls into two or more of these categories. For example, I have quite oily skin on my forehead. Yet, my cheeks are dry and a little bit sensitive. So, as you can see, it’s very important that health and beauty products are able to adapt to this variety of skin types. 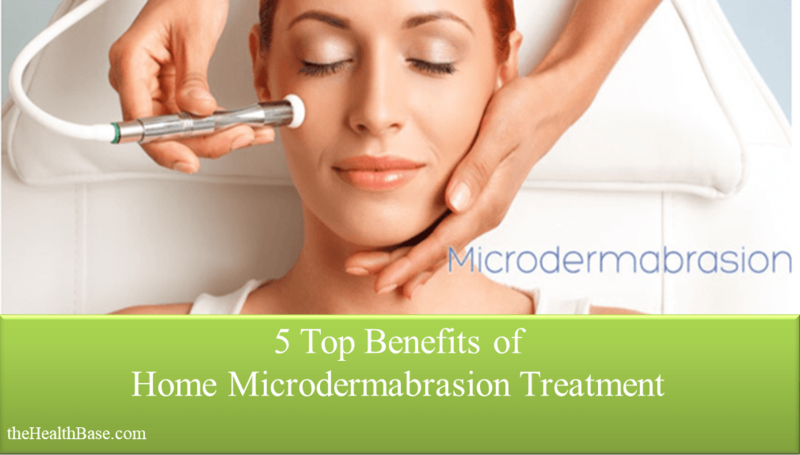 This is why home microdermabrasion treatments are so effective and favored. These machines are suitable for all skin types. This is a key reason why home kits are a step above other exfoliation methods. A huge reason for our skin becoming dull and lifeless looking is because the effect that the sun has on faces. The UV rays of the sun can cause accumulative damage to occur which is really quite harmful to the health of our skin. Even if we take all the correct preventative measures like using sunscreen and daily moisturizing, it’s still very easy for the sun to damage our facial skin. This damage can come in the form of sun spots; our pores becoming enlarged; and wrinkles appearing over time. This will ultimately cause the skin on our face to become negatively affected in both appearance and overall health. Well, there you have it – that’s the top 5 benefits that I believe these machines can deliver to your skin. Of course, these are just the five that I think are the most important. There are many, many more. Below I’ve bulletpointed a few just so that you’re aware of them. I hope that you found this review helpful. As I’m sure you can see, we at the Health Base are big fans of home microdermabrasion kits and the treatment that they provide. We really do believe these machines are the best thing going when it comes to exfoliating techniques. As always, feel free to get in touch with us. Whether you have a specific or general question, or simply want to chat about something, then shoot us a message and we’ll get back to you ASAP. 🙂 Also, if you’d like more information on this matter, take a look at our related content that is supplied underneath.